I'll see if I can get a copy. If I do, I'll be back with a review. Eds note, 2/17/17: Scroll down to see curated list of links to articles about Smith's book. I love word play. 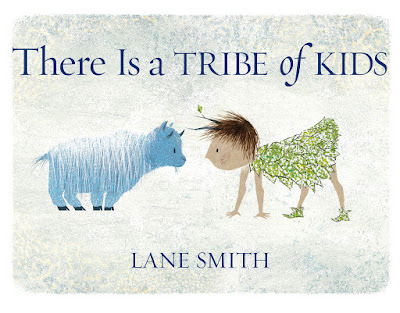 Lane Smith's book is getting a lot of love for its word play, but I'm tagging his book as Not Recommended. It is a 2016 book, published by Roaring Book Press/Macmillan. Here's the cover of his new book, There Is a Tribe of Kids. The blue creature to the left is meant to be a young mountain goat, or, a kid (that is the term for a baby goat). We follow the child on the right as we read There Is a TRIBE of KIDS. 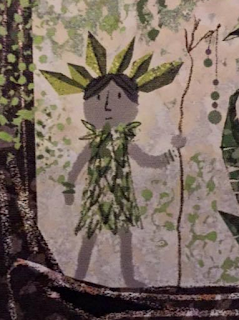 That child is a kid, too, of course, which tells us that Smith is doing some word play in the book. See the two sticks coming out of the child's head? See the stance the child is in? That child is playing at being a goat kid. Note that two words in the book title are in capital letters. They go together. That's a pattern that Smith uses throughout the book, and as a former elementary school teacher, it is kind of detail that I'd love to point out to kids. 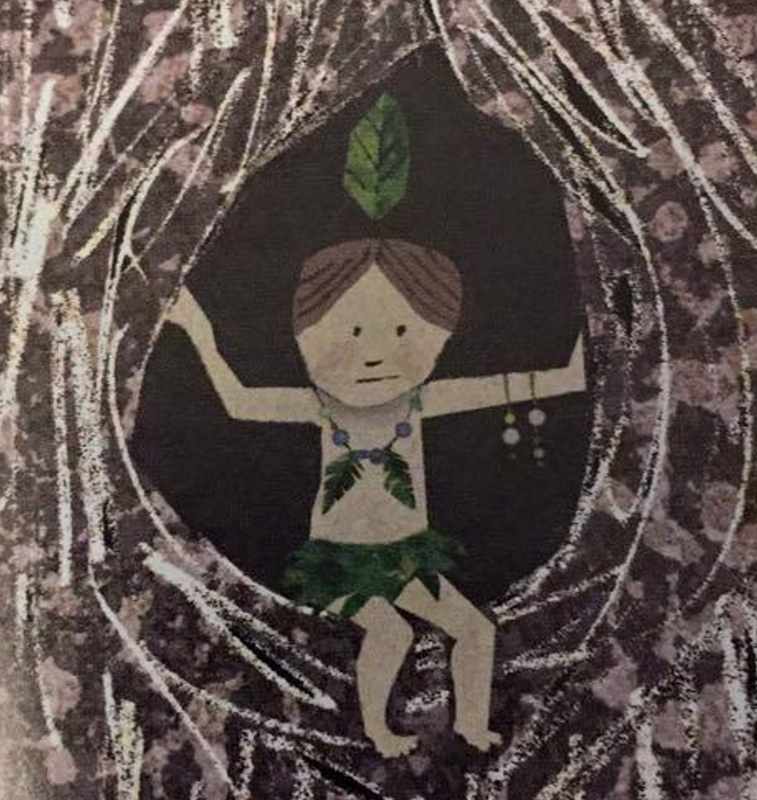 Smith's error is using the word TRIBE on the final pages of the book, to refer to children who are playing, adorned in various ways with leaves. I'm getting ahead of myself, though. Let's go back to the opening pages. On the title page the child is with three kids (goats) as an adult goat looks down on them from atop a rock. On the next page, the three kids climb the rock, leaving the child alone. The child stands upright and walks away from the rock, discarding the horns. Beneath that illustration are the words "There WAS a TRIBE of KIDS." The three kids the child was with are part of a tribe (tribe is another word for herd), but since they've left him behind, Smith uses the past tense (was). Beneath that sentence is an illustration of the child looking across the page at a penguin. 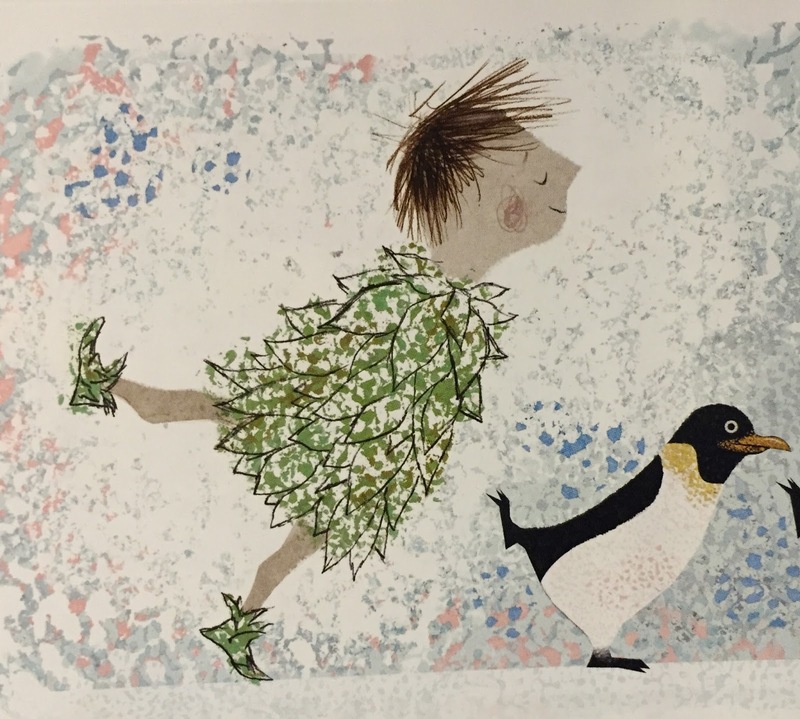 The child is shown in the same pose the penguin is in. On the next page the child is shown in the same pose as four penguins (see the illustration to the right). As we saw with the goats, the penguins leave (they go into the water and the child follows), and the text is "There was a COLONY of PENGUINS." In the water, the child is in the midst of jellyfish. In a series of illustrations, we see the child's leaf shirt float up and then into a balloon shape, which are the shapes of jellyfish as they swim. That's the pattern of the book. The child is with a group of some kind, and while with that group, the child's leaf clothing or body positioning emulates that group. On some pages, the child is just shown with the group. On one page, the child sits atop a whale. A raven picks the child up off the whale's back and flies with other ravens; the raven opens its beak and for an instant the child is flying but then drops to the ground and lands on a pile of boulders. 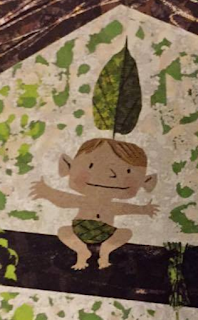 The child plays on the boulders (holding his body like one), falls headfirst into some flowering plants, and when the child is upright again, the child has leaf arms and leaf ears and a flower atop its head. The child finds elephants and then, those leaf ears are like elephant ears. As we get to the end of the story, the child is near the ocean, which has a bed of clams. The child uses one as a bed. 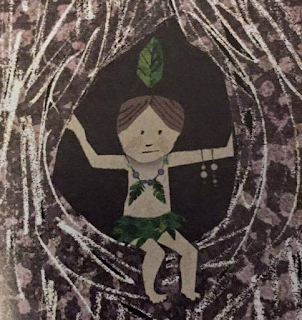 In the morning the child wakes, alone, abandons the leaf shirt and follows a trail of shells and finds "a TRIBE of KIDS" playing beneath and on the branches of a massive tree. There are 28 children. What are they playing? They've all got leaves on, in some way. 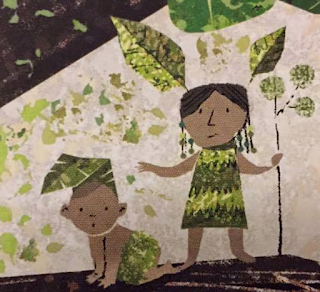 Here are the ones with a leaf/leaves on their heads. Coupled with the word TRIBE on that page, it looks to me like they're dressed up to play Indian. Remember the pattern of the book. The child we followed from one page to the next was (mostly) shown doing something to emulate something else. "been willing to look a little deeper, beyond just the immediate Oh no! we are insulting Native Americans again, as we have done so often in the past." When I read that line in italics, I was incensed. She's being quite dismissive of criticism of stereotyping, bias, appropriation---all those things that white writers, including her, have done. A few years ago, I reviewed Parry's Written In Stone. There's a lot wrong with that book. She wrote to me privately to talk about my review, but I preferred the conversation to be public so that others could follow and learn from it. Many did. Parry did not. Indeed, Parry's resistance was remarkable. 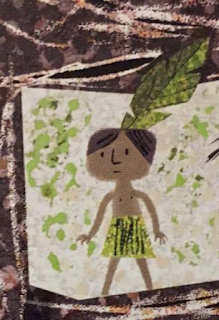 She was so sure that she was right to make up traditional Native stories, and right to make up petroglyphs and assign them meaning, and right to write that story because the Native kids she taught--she told us--wanted her to write a story about them. Sheesh! White savior to the rescue! "didn't immediately make the leap to Native American tribes because there are no tribes in North America who dress in garments made of leaves. Plant fibers woven into cloth, yes. Dance costumes made of pale yellow grasses, yes. But broad-leafed green plans arranged around the body as a short cloak? No." "didn't see a single reference, even an oblique one, to a Native American tribe or any tribal activity of North America. No hunting, no fishing, no fires, no tomahawks, no archery, no totem poles, no teepees, no drums, no horses, no canoes." "an ancient mythological figure associated with the Celtic tribes." "one of the most racially inclusive books on our bookstore shelves this year. Not only that, it's a racially inclusive book that isn't about slavery or civil rights or westward expansion, which often cast Black and Native American characters as victims." "arranging shells, playing ball, swinging, sliding, climbing, dancing, running, hiding, napping"
"a mockery of Native Americans. If they were wearing fringed buckskins or button blankets or powwow dance costumes or had painted faces or were brandishing bows and arrows, that would be an entirely different story." "Who are we to shame them by saying this is playing Indian?" Shame. That word is getting used a lot in children's literature discussions last year and this one, too. Us Native and people of color are being mean, shaming writers and now--Parry tells us--the way that kids play. Sigh. Yes, some of the kids are sliding. And some are playing ball, etc. But look at the illustrations I shared above. What are we to make of them? They're not active in any way. They're just there, wearing their leaf feathers, holding staffs, standing, sitting, jewelry dangling from neck/wrist/ears... What about them? Parry offers workshops on how to get things right. If you're a writer, avoid her. I wish I could say she's clueless, but I think she is being deliberately obtuse. She'll lead you to think your problematic story of appropriation is ok. It won't be. I acknowledge that I'm clearly incensed with her and I anticipate lot of people coming to her defense. Parry and others (as Sam Bloom noted, There Is a Tribe of Kids is getting starred reviews) don't see--and refuse to see--the problems in the book. That's where we are in 2016. Part of the contentious discussion is that tribe doesn't mean Native peoples. That is, of course, true. However, in the U.S., that's what the word generally invokes. Some evidence: In preparing this review, I did a search of children's books at Amazon and at Barnes and Noble, using "tribe" as the search term. The results make it clear that the word is coupled with Native peoples. I didn't include discussion of the word in this review but will discuss it in another post.